How can I format my formative assessment? There are many formatting options that you can use to format your formative assessments, polls, exit tickets, quizzes, and homework. 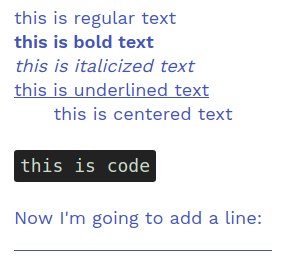 These include bold, underline, italics, and more. 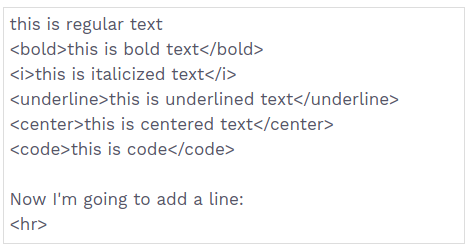 In general, you can add formatting by using the html-like style attributes. That means that you’ll want to put html tags (the < and > symbols) around the words that you want to format. Just copy and paste the examples below to get started! Additional formatting options are also available to help you write mathematical notation, which are documented in the Math Editor Guide. And for additional control of your layout, you can also use a subset of the LaTex typesetting system. PrevPreviousWhat are some ways to challenge my students using Woot Math?